Sometimes, the cause of the pain in your teeth may be truly hidden. And by hidden, I mean it happens while you sleep, or you are simply unaware of it. Clenching, grinding your teeth while you sleep can cause tremendous damage to your teeth, as the force of the bite is truly tremendous and the stress you can exert on your teeth and their structure can cause irreversible damage to your teeth, your joints and your whole mouth. If you have a headache or pain in your jaw for no other apparent reason, visit your dentist and discuss this problem, as it may be a sign of you clenching and/or grinding your teeth. What is teeth grinding and clenching? 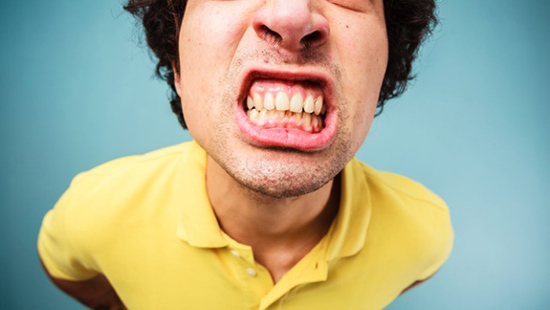 Teeth grinding, also called bruxism involves moving the jaw while holding the teeth tight together. This can happen during sleep or even during daytime and it may result in quite extensive noticeable wear of the teeth. The teeth start to look more flat, probably a first visible sign of this problem. Clenching is just holding the teeth together while flexing or tightening your jaw muscles. Typically, grinding of teeth happens during sleep. Clenching on the other hand, happens at night as well as while we are awake, although most of the “clenchers” are not even aware of it. Most of the time, the clenching results in less wear of the teeth but it can cause quite a bit of soreness in the jaw and muscles, pain and joint damage. In both cases, extreme forces that are produced by the jaws during clenching or grinding can result in overemployment of the jaw muscles, which often leads to pain or fatigue in the jaw (typically in the morning). Obstructive sleep apnea, loud snoring. Teeth grinding has been proven to be sometimes related to a sleep disorder. Recently, studies have shown that increased brain activity and heart rate happen right before the actual grinding of the teeth, in people that are “grinders”. In the past, it was felt that a bad bite or a malocclusion was the cause of bruxism, however, numerous scientific studies have failed to show a relationship. Abnormal bite or teeth that are missing or crooked. The dentist can commonly diagnose teeth grinding/clenching habits by taking a thorough medical and dental history and performing a comprehensive clinical investigation. Patients who report discomfort or fatigue in their jaw muscles upon awakening in the morning are potential candidates for this type of condition. Clinically, excessive wear or teeth that look shorter, closer to the gum, with flat edges can indicate bruxism problem. In children, there is probably not a lot that needs to be done in most of the cases since their jaws and their teeth are still growing and developing. Most of the kids will grow out of this habit by adolescence but it is still recommended to discuss this with your dentist as sometimes this problem may be more complex and precautions need to be taken. Sometimes, it helps to learn how to relax your jaw, there are some simple exercises that you can do to help yourself with this habit. Mouth guard is custom made to fit exactly over your teeth, to protect your teeth during sleep. Your dentist will take an impression of your teeth and your bite and have this dental device produced. The dentist will fit this mouth guard in your mouth at your next visit and adjust subsequently, as needed. Sometimes, in more severe cases, a muscle relaxant may be recommended by your dentist or your physician, to help you relax before you go to bed. Teeth grinding is a very is a common cause for tooth pain. At Imperial Dental Center, our experienced dental team lead by Dr. Angelova is happy to provide you with the latest technological solutions to treat teeth grinding as we use only the highest quality products to treat this problem. An appropriate mouth guard can be custom produced. We use only the top quality materials and dental laboratories for our mouth guards, which are custom produced for your individual needs.